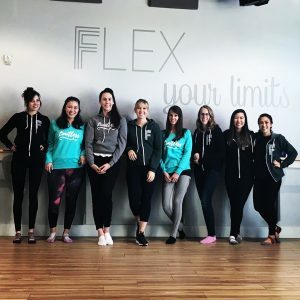 Flex Fusion teachers are more than fit and friendly, they’re experts in their fitness styles. Each barre teacher has passed their ACE barre certification which requires an advanced understanding of kinesiology, so you are always in good hands. Our yogis are certified through yoga alliance and all of our teachers are experienced in offering modifications, adjustments and pre/postal adaptations. Many of our Flexstaff hold multiple certificates including personal training, group fitness, TRX, and/or Zumba. Most importantly, all of our teachers love to share their passion for fun, safe fitness with everyone they meet. Introduce yourself, let’s be workout buddies! Don’t forget about the friendliest barretenders in the bay! These lovely ladies will be there to check you in, help you find your class, and introduce you to your teacher.